Speed Limit is 10 mph, ALL vehicles must abide this speed limit for there are many children around as well as other people. ALL Visitors must check-in at the Store. All visitors must leave by 9:00 pm or they will have to pay. Vehicles (Trucks, Cars, Vans, SUVs, Motorcycles, etc.) are allowed, however please use them properly. If they are used improperly or are too noisy there use will be restricted. DO NOT peel or cut trees or bark of trees in the campground. There is firewood available at the store. DO NOT use Chainsaws in the Campground. DO NOT discharge waste water on the ground. Waste water is to be dumped in the dumping station ONLY. Maine State Law. Pets are permitted, there is a $10.00 fee for pets. However, they have to be on a leash and cannot be left unattended. Pet owners must clean up after their pet. QUIET HOURS are between 10:00 pm and 8:00 am. Please do not play loud music, use generators (unless needed for medical problem), just be courteous of others who may be resting or sleeping. Price per campsite is $32.00 per family per night (2 adults an children 17 and under) each addional adult is $5.00 per night. Price does not include 9% lodging tax. response to any reasonable request we may have. Annual Lobster Bake: The Saturday of the fourth of July weekend we have a huge lobster bake. There is all sorts of food - Lobster, Hamburgers, Hot Dogs, Potatoes, Corn, Eggs, Onions, Chips, Soda, and Blueberry Cake. It is always a great time! Pot Luck Dinners: We will have a pot luck dinner held at the picnic area in front of the store periodically throughout the camping season. They are always a lot of fun and there is always plenty of food! Bean-Hole Bean Dinners: We also periodically have a bean-hole dinners. Were we make the bean-hole beans, homemade bread or rolls, dessert, and supply the drinks (water, lemonade, ice tea). "Awesome! Glad we got lost!" Camera - to take lots of pictures to help you remember your vacation, to capture those can-did moments with friends and family, and of course to take pictures of Maine's cuddly critters. Camping Gear - camper/tent, sleeping bag, pillow, clothes, toiletries, etc. Coolers - to store your goodies and keep them cool. Food - make sure to lots of goodies to munch on while camping. Don't forget to bring stuff to make the famous camping treat "smores". Oh yeah don't forget to bring your tent poles as they will help make your camping experience better. "Very beautiful up here even in the rain." 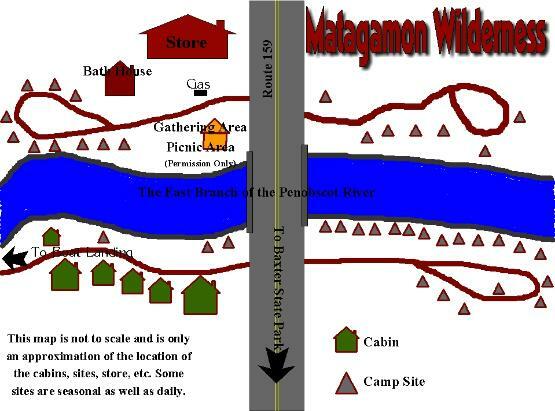 The Location: The Campground at Matagamon Wilderness is neatly tucked in on the shore of the East Branch of the Penobscot River. Sites: There are 36+ Wilderness Campsites. Some of which are seasonal sites. Accommodation: We can accommodate tenters as well as campers up to 42'. Campsite Accessories: All campsites are equipped with a fire ring and picnic table. Shower House: A coin operated public shower is available by the store. Privies: There are outhouses in the campground which, are cleaned daily. Dumping Station: We do have a dumping station - there is no fee to use the dumping station for those who are staying in the campground. However, there is a $5.00 fee for those who are not staying in the campground. Spring/Summer: Boating, canoing, fishing, hiking, kayaking, mountain biking, swimming, relaxing, tubing in the river, and old fashioned camping FUN! Fall: Hunting, fishing, leaf peeping, and relaxation. Winter: Ice Fishing, Snowmobiling, Cross Country Skiing, Snowshoeing, Relaxing. "Good People - Good Food."